In the run-up to the Energy Storage Europe conference pv magazine is featuring the top ten developments in the field as our Energy Storage Highlights, selected by an independent jury of experts. Yesterday we entered our top five, with MAN’s thermoelectric energy storage. Across more than a dozen islands, Trina has places storage containers like this with a combined capacity of 2.6 MW. Beneath blue skies and palm trees the systems is a literal island grid. This week we are back with our Energy Storage Highlights Countdown, in the run-up to Energy Storage Europe Düsseldorf, on March 12-14. Messe Düsseldorf has partnered with pv magazine to produce a special publication for the event. As part of the project, we tasked an independent jury of experts to rank a range of Energy Storage Highlights that will be exhibited at the event. The full ranking will appear in the Energy Storage special issue. This week we have already presented a thermoelectric energy storage approach by MAN Energy Solutions. Islands have been a market for solar and battery storage for some time – the term ‘to island a grid’ explains everything in this regard. By installing solar and storage, diesel generators can be replaced. Trina Solar has now presented an electrification project that takes a particularly holistic approach to island power provision. The Maldives are a group of islands occupying a similar portion of the globe to Scotland but with a total land area only as large as Edinburgh. That poses challenges for solar electrification, as a separate microgrid has to be planned for each islands. Lying some distance apart, the islands have no electric interconnections. Trina’s Micro-Grids project spans 14 islands and Trinabess, the EPC division of the company, designed and installed the project. Given the limited land available, the systems are distributed over multiple rooftops in arrays ranging from 60 kW up to 330 kW – for a combined capacity of 2.6 MW. Trina says it trained locals to install the systems. The battery storage units have a combined capacity of 2.6 MWh. The systems are designed in such a way that in principle they are grid forming, meaning diesel generators can be switched off for long periods. On a typical day, significant diesel generator output is only required from around 6 pm, when solar output is insufficient and batteries are fully discharged. Without storage, the diesel gensets would have to be switched on from around 4 pm. 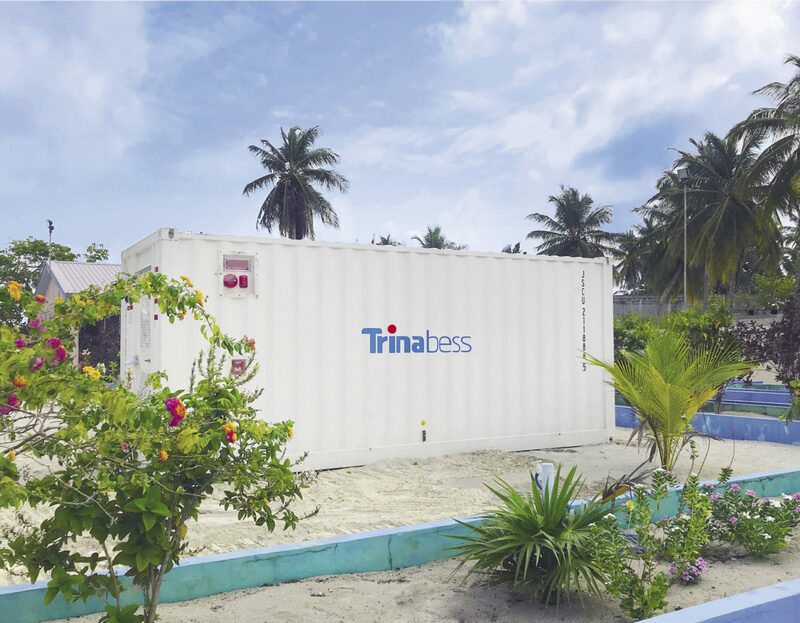 In the second, Trinabess is installing a further 2.3 MW of PV generation capacity and 1.5 MWh of battery storage capacity on 13 islands. Trina says the advantage of the new microgrids is not only the fact 2.6 million liters of diesel will be saved annually, but also that the grid is more robust and costs fall because the average price for a kilowatt hour from diesel gensets is $0.70.